The "Rich to Lean response rate deterioration level*" value is standard or less (2 trip detection logic). The "Lean to Rich response rate deterioration level*" value is standard or more (2 trip detection logic). The "Rich to Lean delay level*" value is standard or more (2 trip detection logic). The "Lean to Rich delay level*" value is standard or more (2 trip detection logic). *: Calculated by ECM based on the air fuel ratio sensor output. After the engine has been warmed up, the ECM carries out air fuel ratio feedback control, and maintains the air fuel ratio at the theoretical level. In addition, after all the preconditions have been met, active air fuel ratio control is carried out for approximately 10 seconds and during active air fuel ratio control, the ECM measures the response of the air fuel ratio sensor by increasing or decreasing a specific injection quantity based on the theoretical air fuel ratio learned during normal air fuel control. The ECM determines whether there is an air fuel ratio sensor malfunction at the mid-point of active air fuel ratio control. If the air fuel ratio sensor's response ability is reduced, DTC P014C and P014D are output. If the air fuel ratio sensor output timing is delayed, DTC P015A and P015B are output. 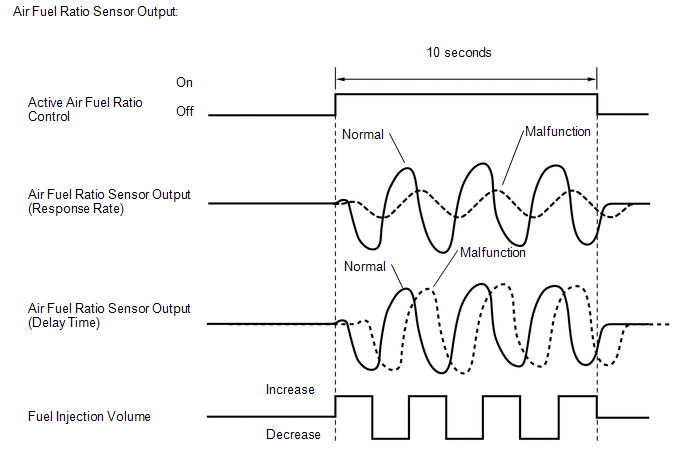 Performing this confirmation pattern will activate the air fuel ratio sensor response monitor. Check that O2 Sensor / Current is Incomplete. The test values for the test items RL RES RATE B1S1, LR RES RATE B1S1, RL DELAY B1S1 and LR DELAY B1S1 do not exist in the Detail of O2 Sensor monitor at this time (the initial value of "0.000" is indicated in each test item). Start the engine and warm it up (until the engine coolant temperature is 75°C (167°F) or higher) [A]. Drive the vehicle at a constant speed between 75 and 100 km/h (47 and 62 mph) for 10 minutes [B]. Check that O2 Sensor / Current becomes Complete. Check the test values on the Techstream by entering the following menus: Powertrain / Engine / Monitor / Current Monitor / O2 Sensor / Details / RL RES RATE B1S1, LR RES RATE B1S1, RL DELAY B1S1 and LR DELAY B1S1. If the monitor item O2 Sensor / Current does not become Complete (if the test values indicated on the Techstream do not change), perform Readiness Monitor Drive Pattern for the air fuel ratio sensor and heated oxygen sensor (See page ). Input the DTC: P014C, P014D, P015A or P015B. If the judgment result is INCOMPLETE or N/A, drive the vehicle again under an increased load and then recheck the judgment result. 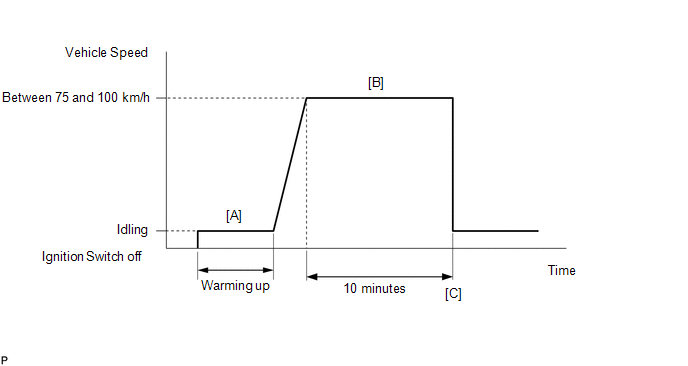 If any DTCs other than P014C, P014D, P015A or P015B are output, troubleshoot those DTCs first. (a) Check that the proper air fuel ratio sensors are installed to the vehicle. (a) Drive the vehicle according to the Confirmation Driving Pattern. (d) Enter the following menus: Powertrain / Engine / Trouble Codes / Pending. (e) Read the pending DTCs.